Tonight we’re eating seared spice-rubbed tilapia with a lemon-herb butter sauce. The fish is served with roasted garlic-herb smashed red potatoes and sauteed yellow squash, zucchini, red peppers, and cherry tomatoes. 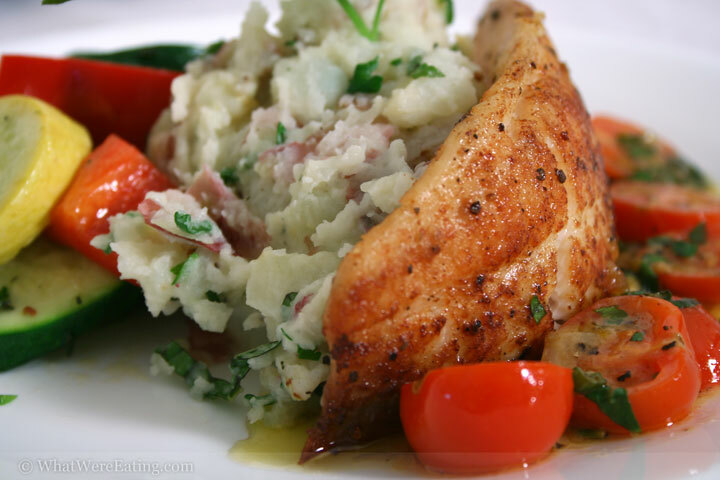 Seared Tilapia with Roasted Garlic Herb Smashed Potatoes and Sauteed VeggiesT: Do you have anything to say? T: Well, this tilapia was truly wicked. I had to go back for seconds. A: I really enjoy the fact that we are back into eating more fish. Before we moved out here we were eating fish regularly, and when we first got here i thought we would be eating it all the time since we live ON THE PACIFIC. but we really haven’t started eating fish again until recently. T: yeah, I love fish. Sometime we need to go to a fish market like the kind the sushi restaurants buy from. See if we can score some killer fish. A: i wish we knew of a good fish market around here. every place i’ve been to has been over priced and it just doesn’t seem like it’s local. it’s just weird eating all this atlantic fish while living where we live. T: Yeah that’s so messed up. There are millions of fish living 3 miles from here, and we are eating fish from the Atlantic. That’s not right. We could save some fuel in this country by eating the food living in our back yard! A: AMEN! EAT LOCAL! okay, we really do need to start doing that. i try to buy only local produce by shoping at farmers markets and such, but i’m poor, yo. it gets hard to shop for local meats and fish when it’s all so damned expensive and i’m so damned broke. T: word. We’re going to have to start making more money. It’s time to become nurses. A: i know.. but that takes money too! if we could just find a job that doesn’t require training but pays really well! anybody?? any suggestions?? T: OK, you become a professional personal chef, and I’ll… …. become a professional surfer! A: 😛 i would love to do personal cheffing, i just can’t quit my day job yet… hold on… night job. T: Once I hit it big as a surfer you can quit your job and focus on the cheffing. A: awesome! now all you have to do is get a surf board, and learn to surf! T: Yeah. It looks pretty easy. I’ve seen it on TV. A: i know, you’ve got those 40 foot waves… i’m sure you can do that. T: I don’t see why not. T: If anybody wants to sponsor me, email me and we can set somthing up, like some surf lessons. A: well, now that we’ve got a life plan, maybe we should talk about what we had for dinner on this here food blog. T: We had some very delicious tilapia. Do tilapia live in the waters around here? A: To be honest, i really don’t know the answer to that. I hope they do, i like to think we ate fresh fish. Trader Joe’s is the source of the mysterious tilapia. Their fish is always pretty good. T: It was definately tasty fish. And very tasty potatoes, and very tasty veggies. I thought this meal was quite excellent. Damn you got the skills. I give this meal a 4.64/5. It was super good. I don’t have any complaints about it. It all went really well together. The veggies were cooked wonderfully. I really liked the red bell peppers tonight. mmm. Good stuff. A: Thanks T! I enjoyed this one too… The veggies were wonderfully crisp and the fish was moist, juicy and spicy! I used an entire plate full of fresh herbs making dinner tonight. That’s always a sign of goodness. i give this meal a 4.5333/5. This is another one i would be happy to eat most any night. Unfortunately, i rarely fix the same thing twice, just to keep it fresh… but maybe one day we’ll see it again! T: I’m sure that if we do see it again that it will be a different animal altogether! Always funky fresh. T: No, darling, we live in La Jolla, and that kind of uneducated talk is simply unacceptable! Tah! A: Indeed I say, Tyler! It certainly is most unacceptable! T: Right right! Shall we run to the market and pick up an i-pod from the vending machine? A: I’ve got plenty of i-pods after yesterday’s visit. Perhaps we can acquire some accessories. T: But I’ve got a closet full of accessories! I’m so bored with accessories, I want more ipods! A: Alright Veruca dear, we’ll get more i-pods! T: I want them NOW. T: Seriously though, folks, there is a Von’s grocery store near our apartment with a vending machine (kinda like a snack machine) that sells ipods, ipod accessories, psp’s, psp accessories. We thought that was insane. A: It’s wrong, just wrong. there is too much wealth around here. This dish looks AMAZING. I’m definitely going to frequent this website. Maybe every day Keep up the great recipes. 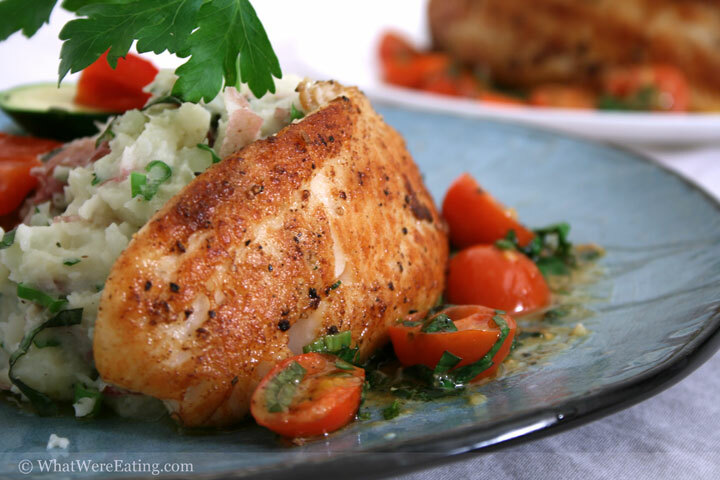 I love tilapia and I think I’m going to try this out tonight. BTW, I love the web layout and design, GREAT photography and overall layout. I am a photographer myself and would love to do photos for you if you ever need them done! Although, by the way your pictures look it doesn’t look like you need one. Anyways, Keep up the great work! This stuff looks delicious! P.S. – thanks for making “Smashed” potatoes, and not whipped. I like to chew my taters … not drink them. Thanks Adrian! We love to have frequent visitors. I don’t know if we have any of thos yet (other than tyler and me ;-P) The layout and design are definately tyler’s brain child and we generally both take pics and see how they come out. Maybe you could come to dinner and take pics and join the pic pool that we take the best from! Are you in San Diego? Adam, thank god, my computer has speakers because this website has yet to make any money to supply our i-pod habit. One day i tell you, one day. And i wouldn’t think of having whipped potatoes… not in my kitchen! the great show feelings are mutual, we are definately waiting for the next pod-cast. This looks, and sounds amazing. However, where is the recipe?? ?